Responding to the biblical command that families raise their children in the knowledge and admonition of the Lord, Tomah Baptist Academy provides a Christ-centered education that permanently instills and reinforces Christian thought, belief and practice in all areas of life. Whether you are a prospective parent checking out Christian schools in Tomah, WI. or a current parent or student looking for updated school information, we hope what you find here is both inspiring and informative! 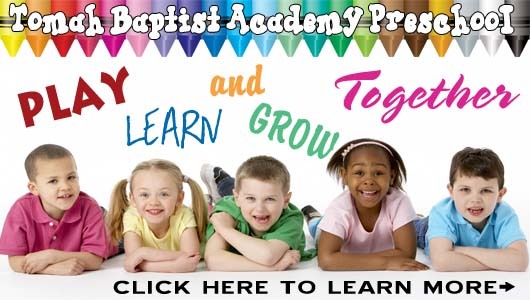 Tomah Baptist Academy serves students in grades Preschool and K4 – 12. At Tomah Baptist Academy, our Mission is to provide an excellent classical education founded upon a biblical worldview. All subjects are taught as part of an integrated whole, with the Scriptures at the center, serving as the hub of all knowledge. As a result, students learn to interrelate and examine knowledge, allowing them to view their studies as a unified effort. At Tomah Baptist Academy, students learn more than just their subject matter—they come to understand the most important academic skill of all—they learn how to learn. With small class sizes and strong family relationships, the staff at Tomah Baptist Academyl is able to complement each student's particular strengths, carefully monitor each student’s progress, and supportively nurture each student’s gifts and abilities. Within this community, under the guidance of a professional and attentive faculty, students at TBA are mentored for academic success and spiritual strength, preparing them for the challenging world of tomorrow. Tomah Baptist Academy is blessed with a spacious and comfortable school setting. Year-round climate control ensures that every classroom is an effective learning environment. We have many well-equipped rooms, including a computer lab, library and practice rooms. Our facilities insure adequate space to provide many opportunities for effective ministry in our day school. Located off of Hwy 16 and Hollister Avenue in Tomah, WI, and situated between the two military bases of Fort McCoy and Volk Field, Tomah Baptist Academy offers a full Kindergarten through 12th grade program whose ultimate goal is the development of students prepared spiritually and academically to serve Jesus Christ and to impact the world through their character and leadership. For a map and directions, simply click here. Any questions? Just contact us! Bring in Boxtops, Campbell's Labels, Ink Cartridges and More. Make Your Tuition Payment Online! *Note: If paying your tuition online, please add $2 as an online handling convenience charge. Thank you. Show your appreciation to our featured sponsors by clicking on the link on their logo above. You can also view a complete listing of our supporters on our Donor Page.